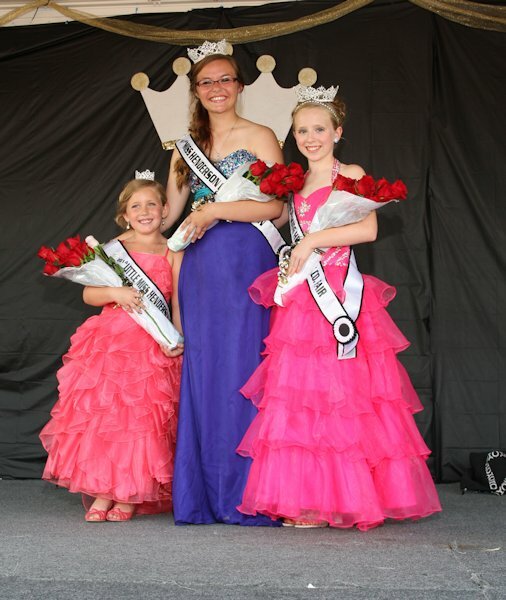 It was a warm night at the Henderson County Fair as 17 young ladies competed for the title of Little Miss, Jr. Miss, and Miss Henderson County Fair Queen. The theme for the pageant was the Roaring 20's. The young ladies started the pageant at 2 p.m. at the Stronghurst Christian Church with the interview competition and then the Queen Contestants competed in the fitness competition before the judges only. At 6 p.m. the contestants competed on stage with speech, evening gown and pop questions. Before crowning the new Queens we had to say goodbye to the 2013 Queens. KAYLYNN HENNENFENT, the 2013 Little Miss, gave a heartfelt thank you to her family, the fair board, her pageant directors and the community for such an amazing year. Next, LAURA NEWTON, the 2013 Jr. Miss gave her farewell speech and thanked everyone for their support and guidance during her year as Jr. Miss. The crowd was almost in tears as the 2013 Henderson County Fair Queen, CATIE STECK, gave her emotional farewell address. Catie has done an outstanding job this year representing the Henderson County Fair across the state of Illinois. She is such an amazing young woman and has always been a great role model to those around her. When the goodbyes were said it was time to crown the 2014 Queens. Little Miss 2nd runner up goes to Lauren Winters. Lauren is the 6 year old daughter of Chris and Jessica Winters of Stronghurst. Little Miss 1st runner up goes to Brooklyn Miller. Brooklyn is the 8 year old daughter of William and Whitney Metler. The 2014 Henderson County Fair Little Miss is GRACE CARGILL. Grace is the 7 year old daughter of Chad and Jayme Cargill of Stronghurst. Junior Miss 1st runner up went to Kendra Cole. Kendra is the 12 year old daughter of Jana Cole and Brett Cole from Media. The 2014 Jr. Miss Henderson County Fair is LAUREN KANE. Lauren is the 10 year old daughter of Joe and Cindy Kane of Little York. Finally it was time to announce the queen court. 1st runner up goes to Jessica Cupps. Jessica is the 17 year old daughter of Tom and Terri Cupps of Oquawka. The 2014 Henderson County Fair Queen is SHAWNEE HARTMAN. Shawnee is the 17 year old daughter of Larry and Dawn Hartman of Oquawka. Shawnee is no stranger to the Henderson County Fair as she has been showing at the fair for many years and is an active member of FFA. Please come out to the fair this week and meet these wonderful young ladies. Pageant Awards- Photogenic- Lauren Winters, Diana Reyes and Marrisa Lange. Director's Awards went to Brooklyn Miller, Brenda Lillie and Shawnee Hartman. Fitness Award went to Jessica Cupps.